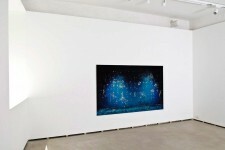 Federica Schiavo Gallery is proud to present Rehearsal, Interval, Tonight:, Anne Hardy’s first solo show in Italy. 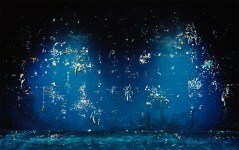 The exhibition comprises four new large-scale photographs. Hardy’s new works confront the viewer with a challenge to the imagination. Hardy states that she sees the works as a form of ‘fictional documentary’, asking us to consider and imagine spaces in a created world that we may actually not ever see. 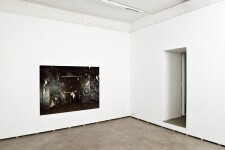 Exhibited, her large format photographs appear as windows into these interiors. Beginning with fragments of the real world; a glimpse through a door, a changing notice board, a modernist mosaic, or the overheard sou nds of a weekly meeting room, Hardy constructs sets in her stud io over a period of several months, and inhabits them in a performative process. 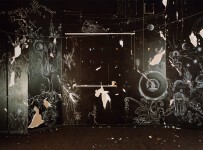 Filled with the traces of fictional and unseen inhabitants and their activities these environments are then photographed, and subsequently demolished. Using the photograph to open a route into these sculptural constructions, the shifting planes of illusion within the images guide us through the spaces, as mirrors, drawings and surface accretions play with the stability of our view into these rooms. In Tonight: (2010) a dark ambiance proliferates the scene revealing gentle white handmade drawings along a flaking wall. The decaying walls and strange debris littering the floor leave an open-ended question. 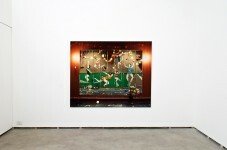 The answer as to what the room represents remains elusive as Hardy’s hints continuously imply and disprove. The work draws attention not only to the tension between illusory and flat space within the image but also to the literal surface of the paper on which the image is printed. Wall (2011) presents us with a similarly architecturally simple space, which shifts perceptually as we attempt to grasp the scale and nature of what exists there. In Rehearsal (2010) mirrors reflect an entire room. What appears to be a gym has a mural reflected of female figures exercising to achieve a more perfect bodily form, their real counterparts are nowhere to be seen. Loosely based on a modernist mosaic with impossibly idealised bodies, this work transfers the utopian ambition of the original mosaic to a more low budget and everyday space, grappling with the gap between the ideal and the real. 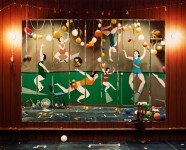 Anne Hardy is currently artist in residence at Camden Arts Centre in London. Over a period of three months she will build a new 'set' in the Artists’ Studio. Hardy will produce a new photograph and for the first time offer visitors the opportunity to experience the actual construction behind the lens.